PREFACE The perceived 'greeness' and sustainability of forages is not without merit. More than any other crop, forages are protective of the environment, thanks to massive root systems, long periods of growth and year-round ground cover. Forage shield the soil against salinization and degradation by erosion and subsidence. In fact forages, more than any other crop ... read more. I’ve always admired the coffee-table books with gorgeous photography and interesting insights. Although such books have frequently caught my eye over the years, my interest was short-lived when I realized I would have to look at that book every day for the next 10 years. I just didn’t think the subject matter would be interesting for that long, so I never acquired one – until now. 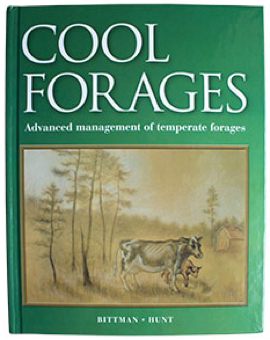 "Cool Forages: Advanced Management of Temperate Forages," a collection of informational articles written by forage specialists throughout North America and edited by Shabtai Bittman and Derek Hunt, is that book. See more about this reader-friendly forage book.